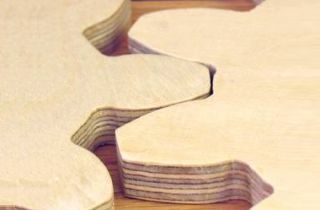 This free online gear template generator is designed for making scale accurate paper gear templates which you can glue onto wood and then cut out with a bandsaw. 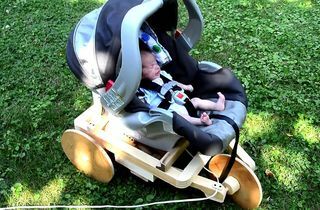 I recommend printing the gears with an ink jet printer. Even cheap ink jet printers print very scale accurate but Not all laser printers are accurate. Number of millimeters from one tooth to the next, along the pitch diameter. Number of teeth on gear to render for gear. Controls left gear when showing two gears. Enter negative value for ring gears. Change gear 1 to a linear gear (rack). You can also make the other gear a rack by entering "0" for the tooth count. The pressure angle of the gears. 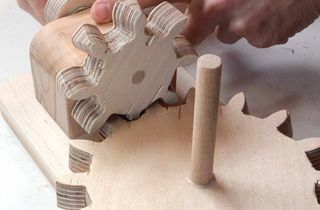 For gears with smaller number of teeth, set this a bit larger, to get more sloped teeth that are less likely to jam. Number of teeth for the gear on the right, if rendered. 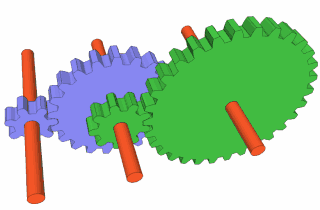 The checkbox controls whether one or two gears are rendered. When printing templates, it helps to have just one gear shown. Rotate the gears shown slightly. 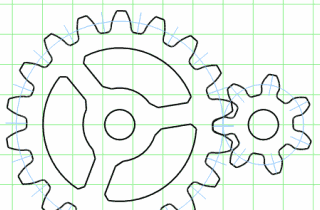 Useful for checking the fit of gears at different angles when showing two gears on the screen. Use values 0 to 100 to indicate percentage of one tooth advance of rotation. 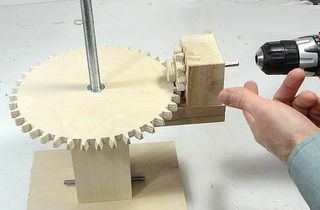 Show the pitch diameter of the gears. The pitch diameter is the effective diameter of the gear. Shows the pressure angle, and the base radius. Turn the gears on the screen. Good for checking meshing of gears with small numbers of teeth. 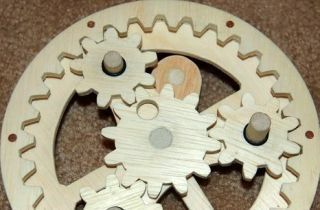 Sometimes you just want to divide a circle into something like 17 equal parts, and the gear template is handy for that. Checking this option just draws the dividing lines and no gear teeth. Different browsers print at different scales depending on browser type and printer configuration. The default scale should be correct for firefox, Internet explorer 10 and Google Chrome. If the scale is not correct (that is, the grid is not 1 cm increments), measure the distance that is labeled "If this is not 150 mm..." in millimeters and enter it in the field "Measured cal distance". I recommend using an ink jet printer. The colour registration requirements of ink jet print heads requires manufacturers to make sure the image is not stretched in either direction, so even cheap ones are quite scale accurate. Some laser printers stretch or distort. 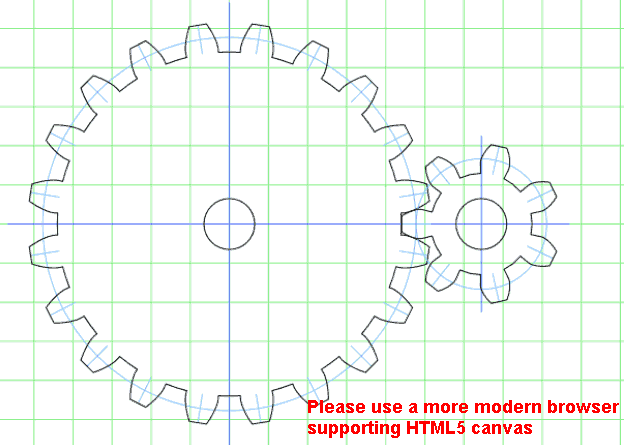 To print the gear template, use the 'Print' button, instead of printing the web page from the browser. The print button hides those parts of this page that you don't want to print, then brings up the print window. To get the sizes specified to be correct, it's best to print a test template, and then measure the distance between the lines at the bottom of the image, and enter that under "Measured cal distance". Only enter this once (the value will reset). Subsequent printouts should be scaled so that the millimeters are exact and the grid has 1 cm spacing. This program only prints what fits on the screen. To fit more, you can zoom out in your browser on a PC by holding down the 'Ctrl' key and puhing the '-' key. 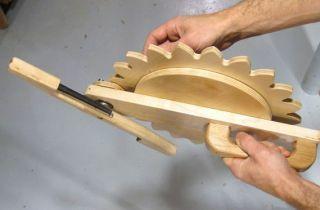 For gears larger than a sheet of paper, the gear is offset from center. If your gear has an even number of teeth, you can print it twice and paste the halves together. If the number of teeth is divisible by 4, you can print it 4 times and paste together. You can print gears up to 40 cm (16") in diameter this way. The gear generator program that I created and sell doesn't need the scale calibration, and can paginate across many pages for larger gears. 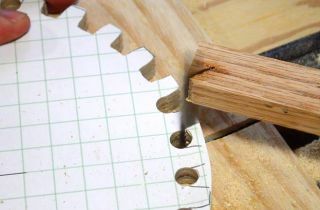 This template generator is intended for generating paper templates for cutting low precision gears from plywood, phenolic, or other suitable materials with a band saw. The gear tooth generation is not perfect. 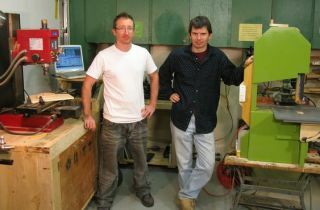 Normally, one rounds the tips of gear teeth a little bit, which this program doesn't do. Also, for gears with less than about 10 teeth, and low tooth angles, it's sometimes necessary to narrow the teeth at the base (undercut) or to alter the geometry (profile shifts). So some combinations with gears of small numbers of teeth may overlap, or jam if they were real. You can check to see if the gears would overlap by selecting the 'animate' and 'two gears' checkboxes for your gears and watching them turn. 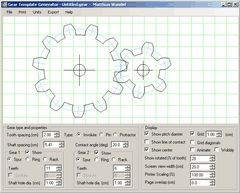 My non-free gear program will automatically calculate the necessary undercut to make the gears mesh. You can also generate rack and pinion gears. 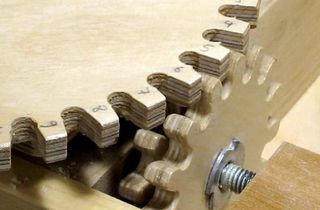 Just enter zero for the number of teeth of a gear, and the program will draw a straight gear rack instead of a gear for that gear.